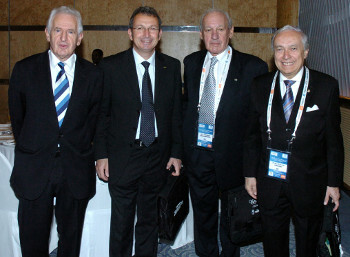 Photographed from left: Jean Durry, Founder of the French National Sport Museum, France; Professor Konstantino Georgiadis, Honorary Dean of the International Olympic Academy, Greece; Dr. Thomas P. Rosandich, President of the United States Sports Academy, United States; and Dr. Franco Ascani, President of the International Sport Cinema and Television Federation (FICTS), Italy. United States Sports Academy President Dr. Thomas P. Rosandich recently traveled to Durban, South Africa, to attend the International Olympic Committee’s (IOC) 7th World Conference on Sport, Education, and Culture, as a member of the IOC Commission for Culture and Olympic Education. The theme of the conference, “Giving a Voice to Youth,” allowed Commission members and young people alike to discuss ways to add value to the Olympic experience, education for sustainable development, developing a culture of healthy lifestyles, and other related topics in an open forum. Serving as one of the conference moderator was the United States Sports Academy’s 2010 Eagle Award recipient, Her Royal Highness Princess Haya Al Hussein, the President of the International Equestrian Federation. Princess Haya was selected to receive the Eagle Award, the Academy’s highest honor, in recognition of her contribution to equestrian sports and the Olympic Movement.